While Family Guy and The Simpsons probably dominate my cartoon watching these days, I’ve always loved Looney Tunes. 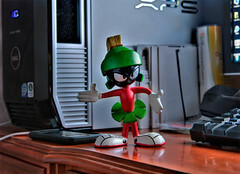 On my desk I have a few small figures: Gumby and Pokey, the manager from Dilbert (soft and squishy so you can take your stress out on him), Jack from Jack in the Box, and of course Marvin the Martian. One night while surfing the net and looking for an excuse to use my new Canon 24-105mm F4L lens, I asked Marvin to step into the limelight once again and star in one of my HDR shots. I was surprised how bright it came out considering that the only light on this shot was from the LCD monitor on Marvin’s left. This entry was posted on Sunday, November 23rd, 2008 at 11:00 pm	and is filed under Blog, Photos. You can follow any responses to this entry through the RSS 2.0 feed.